Ad Astra, as opposed to the Hungarian heavy metal band, is a melodic progressive rock band from Florida. 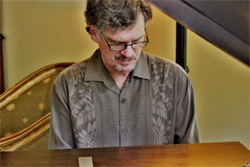 The core of the band is two musicians, two Anglican Christians, Doug Bowers (vocals, keyboards, drum programming, percussion, and music) and Christopher Flynn (guitars, backing vocals, and lyrics). Surface Of Last Scattering is their second album. The music of Ad Astra is largely melodic and lightly symphonic progressive rock similar to some mixture of Neal Morse, Rocket Scientists, maybe touched with later Ambrosia or some Erik Norlander. 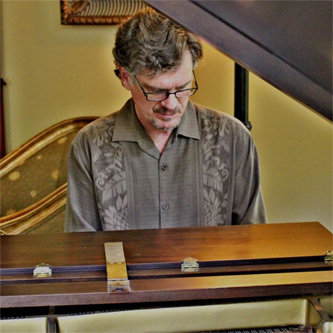 Being the principal composer, with his first best instrument being the piano, Bower's keyboard's basically guide the arrangements, notably the melody. You can definitely hear this in the title track and Lament, the lightest number here. After this comes Flynn's guitar work, yet the CD details that another musician Chuck Tidwell provides the "screaming lead guitar." In this case, Flynn only provides rhythm and occasional filler? I'm not sure. Listening to Pathways, by example, song that moves mostly by Bowers' keyboards and keyboard solos, there seems to be a guitar solo at the end. It's not all that entirely "screaming," but is this Flynn or Tidwell. The questions could be asked of most any song. Alternatively, the solo at the end of the first part of Cradle To The Grave is definitely stronger, in the "screaming" guitar range. Than briefly again at the beginning of the second part of the triptych. Although this gets a bit confusing. Nevertheless, musically, everything about Surface Of Last Scattering screams, pardon the pun, classic melodic progressive rock and sounds pretty terrific. Also, as you might expect, Surface Of Last Scattering has some religious inferences. I say "religious" and "inferences" for several reasons. Preface these for this. Being a Christian myself, for over 30 years, if you call your music the same, or even faith-based, you basically have put a target on your back, for some investigation. Now, if a discussion of Christianity or religious thought upsets you, stop reading but, at the very least buy the album. First, the explanation of the meaning of the name of the album suggests an interpretation of creation beyond the bounds of Christian theology. The one sheet states the album "mixes it up with elements of physics, stellar cartography, and church liturgy." Church liturgy. Leave it to those crazy high church Anglicans. Additionally, while you can look on their web site for their beliefs, the lyrics within, what you can catch as there is no booklet, are at best vague, at worst obtuse. Apparently, when wanting to express your faith and encourage others to consider Christ and Christianity, plain speaking is not necessarily required in Ad Astra's music. I'm not suggesting some rote expression of Scripture or the nonuse of metaphor or allegory, but something more direct, at times, might be more satisfying. Some of my suspicion of the vagueness comes from the last line in the CD's notes and credits. Ad Astra states, of Bowers and Flynn, "Together we thank God for our salvation." God. God who. Being familiar with the Anglican faith, I'm pretty sure I know what they mean. But wouldn't it be more substantial, direct, and superlative to say, "Together we thank God through Jesus Christ for our salvation. Is not Christ the center of Christianity and it's Gospel? That's the problem with some denominational and mainstream evangelical Christians today. Drop Jesus as not to offend, and they sound no better than the many celebs who are thanking some nebulous "god" for their awards. How does veiling the Truth, somehow make it more viable and effective? I wonder. And the editorializing is done. If you dig classic and symphonic melodic progressive rock Ad Astra's Surface Of Last Scattering is quite good, creative and entertaining. Recommended. 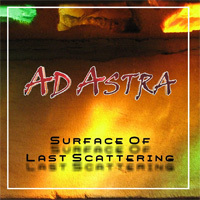 If you dig classic and symphonic melodic progressive rock Ad Astra's Surface Of Last Scattering is quite good, creative and entertaining. Recommended.